Category Archives: Big Boy Room! I realize that I have been the most boring blogger of all time lately. I looked back on the last few weeks of posts and saw what I feared – that most of what I’ve been blogging has been about Matthew’s naps – or lack-there-of. There were four posts in a row that touched on this challenge – and three of those four posts were solely about his recent ditching of naps. Sleep is a major source of stress for me. Back when Matthew was 9.5 months old, we (I) finally decided to try the Ferber method with him because nothing else worked. We tried it all. And when I say we tried it all – I mean – WE TRIED IT ALL. I tried every gentle sleep solution book on the market, and all they did was make his sleeping worse. The Ferber method took a full 14 nights, but it finally worked. I could put him in his crib drowsy but awake at night (but never for naps) and he’d sleep through the night for 10+ hours each and every night. He rarely woke up in the night, and if he did, it was for a good reason (sick or teething). Then, just as we were about to welcome Bryson into the family, I decided Matthew needed to be moved into the new room and queen bed so that the crib could be freed up for Bryson. 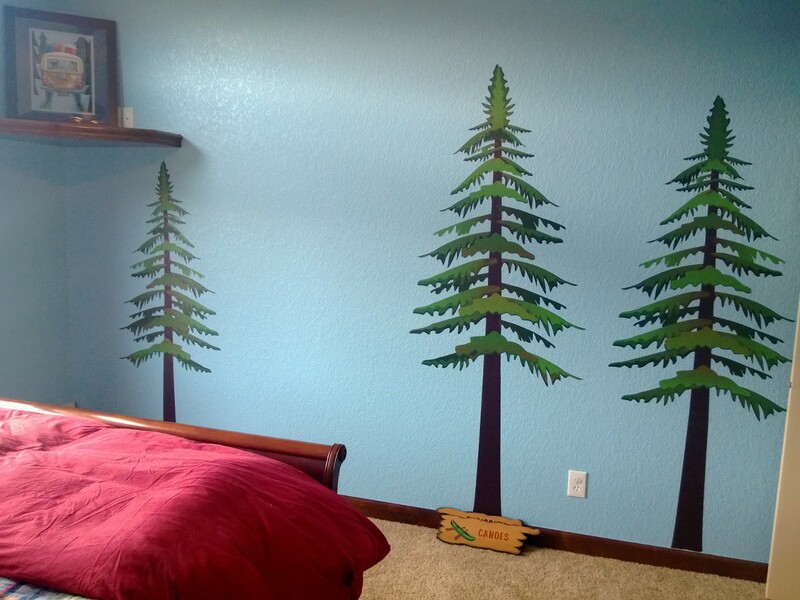 I have to lay in bed with Matthew until he’s asleep or he’ll get out of his bed and rip the tree decals off the wall. It would take anywhere from 30-90 minutes to get him to fall asleep, even when he was tired. I didn’t mind it the three weeks before Bryson was born, but after he came home, I didn’t have that kind of time each night. But it did not matter – I still did it anyway. We kept Matthew up a bit later at night so that he may be more tired and the routine decreased to 30-60 minutes. All the while, Matthew was taking 2-3 hour long naps each and every day in the crib without fail. He was only sleeping 9 hours at night, but making up for it with his naps. It was great! The only problem was that I had to rock him fully to sleep for his naps. Then, on September 17th, Matthew quit napping in the crib (we never transitioned naps to his bed since I don’t have 30-60 minutes during the day to coax him to sleep). I didn’t know it at the time, but that was the beginning of him not napping anymore unless I did something major to fix it. I tried napping him in his bed and that was a disaster. By September 19th, he was done napping. On the 20th, I tried one last time to get him to nap in his bed or the crib and I was beaten and screamed at, the entire time, keeping my cool. I took him to our room and put on a construction truck video and told him to have some quiet time. He fell asleep. He fell into a DEEP sleep. Today is the 27th, and Matthew has napped in our bed for 6 of the last 8 days. He’s sleeping beside me right now as I write this. I have to wake him each day after 1.5-2 hours (I never let him go more than 2 hours anymore). It’s not ideal, but it works for us. It works for him. The only times he hasn’t napped is when I’ve kept him up deliberately because I need him to fall asleep quickly that night (like when B is out-of-town). His bedtime sleep routine (after books are put away) takes 5-30 minutes depending on the length of the nap earlier in the day. I will admit that the best nights are those that follow no nap – he is asleep and I’m out of his room in 15 minutes. But I won’t complain about 30 minutes on a nap day – no way! So this brings me to Bryson. I swore a while back that I would not make the same mistakes I did with Matthew. I refuse to have another baby/toddler who needs me to fall asleep at night. I have been thinking about this, and thinking about this, and thinking about this… as I’ve been rocking Bryson to sleep, letting him sleep in the rocker beside our bed (instead of the crib), and letting him fall asleep with us in our bed while nursing him when he wakes up at night. GAH! Have I learned nothing?! The funny thing is, though, that I did none of those things with Matthew. He was out of our room and in his crib at 5 weeks old, I had him fall asleep on his own for every nap (until he wouldn’t), and I followed all the sleep rules, even if they didn’t make sense to me. And he’s terrible at putting himself to sleep. Bryson was great at putting himself to sleep, but he’s starting to need more help. And I’m starting to be more firm. I will not nurse him to sleep for naps – NEVER! That is how everything started going downhill with Matthew. I remember it. I remember telling B, “well, that worked great – I’m going to do that all the time!” What a mistake that was. I won’t sing and rock him to sleep at night like I did with Matthew. When it’s time to establish a bedtime routine, I’ve told B that I will sing first, then he’ll read books and put him to bed. I am not going to be a crutch. I won’t have my second child napping beside me in my bed when he’s 2 years old. I have started this post over and over again in the last week or so, and as I was rocking Bryson today, Belle’s post popped up. I started reading it, and I then suddenly stopped what I was doing and put Bryson in his crib. I patted his bottom as he drifted off. I watched him wake up, and put himself back to sleep again, several times on the monitor. He was fully up after an hour – but I won’t complain about 60 minutes in the crib. It’s all about establishing good habits, and I have to thank Belle for reminding me of that as I was drifting down a bad sleep path with another child. To be fair, Bryson is a GREAT sleeper! He only wakes up once a night to eat. I feed him around 8:00 and then usually wake him for a “dream feed” around 11:00 or 11:30 before I go to bed. He then sleeps until around 3:00 AM when I feed him once again and put him back to sleep until he wakes around 6:30 or 7:00. I didn’t wake him for a “dream feed” last night and he woke up at 12:30 and then again at 5:00. We are getting very close to the “dream feed” lasting all night for us (11:30 – 6:30/7:00). We never experienced this with Matthew, so this gives me hope that we won’t even have to use Ferber for Bryson. But I’m not holding my breath. I know this can change in an instant. I’ve loved my snuggle time with Matthew, but it’s not something I can do again if it causes Bryson attachment issues at bed time. I will just have to snuggle Bryson extra during the day. Categories: Big Boy Room!, Bryson, Matthew, Sleep | Permalink. I’ve been doing a secret project for Matthew’s room. I did mention this on his room page, but only as a progress item for my own record keeping. I haven’t told many people about it (URL or IRL) because there was a huge chance it would be a complete failure. But it’s not a failure! B came up with this idea to cover the window above Matthew’s main window. Window coverings ranged from $250 (for something stupid looking!) to $800 (for something functional and attractive). Neither of us was willing to pay either of those prices, so B asked if he could cut some plywood and if I would paint a mural on it. I said yes! So we’ve both done our part (his part involved geometry to cut the perfect size, so I think his part was harder even if much quicker than my part – HA!) and it’s turning out better than we both thought it would! I have more painting to do tomorrow, but here it is as it dries tonight! I’m taking quick pictures after each step/night so that this little labor of love is documented properly! Categories: Big Boy Room!, FUN!, Matthew, My Free Time, THIS Moment in Time | Permalink. My outlook on parenting has been pretty laid back. I don’t get bent out of shape about many things, and have mellowed, as a person, since becoming a mom. The same thing happened to my younger sister. She was wound up as tight as a clock before having kids, and once she had her first one, she just relaxed. I remember being shocked by my little sister’s transformation – and here it’s happened to me now. But I’m not so shocked by it this time. My outlook on everything parenting-related is that, “this is temporary.” Breastfeeding woes? They’re temporary. A baby who wakes multiple times a night? This will pass. Food strikes? Give it a week or so. Tantrums and fits? It may take a while, but this too shall pass. A refusal to eat dinner? Represent the food later in the evening. So far, this outlook has worked wonders for me and my sense of calm. Last night went really well. I was shocked, but I thought it was temporary. Tonight went even better! I think we’ve turned the corner to a much better, much faster bedtime routine. The last two nights, Matthew has welcomed bedtime stories with B (he used to cry for me every time). B is having him sit beside him verses on his lap, and Matthew seems to enjoy that. The last three nights, I’ve been taking his big blankets away after we sing because they were distracting him (covering himself up, then taking them off, then covering up again, etc.). He is more settled this way. The last several nights, I’ve encouraged him to lay on the pillows instead of me, and we’re both more comfortable. Matthew falls asleep laying beside me, not on me, and he doesn’t need to face me or touch me to fall asleep. We’re getting so close to me being able to lay him up on the pillows and walk out the minute his little eyes shut. I was only in Matthew’s room for 21 minutes tonight. Before this transition, I was in his room with him for 13 minutes each night (I know this because of our singing routine). I will happily spend 20 minutes with him each night going forward if he’ll let me! Matthew was asleep at 8:55 – just 17 minutes after B walked out of the room. He hasn’t been asleep at 8:55 in over a month! And.. Matthew’s still sleeping through the night. I’ve only had to go in to calm him down (AKA keep him in bed) twice in the nine nights he’s spent in his room. Sure, I went in to lay with him at 5:40 this morning to keep him in bed, but that has only happened twice as well. He’s getting up earlier than we’d like (6-6:30), but if we can get him to sleep at 9:00 each night, I’m OK with that. It’s a give and take. As long as he gets 9 hours of sleep each night, and 2-3 hours of nap time each day, I don’t really care what time he gets up in the morning (well, I do care because before 6:00 is not acceptable). Everything is temporary. That outlook gets me through the tough times, and helps me marvel in the great times! I need to remember this in two weeks when we bring a new baby into this house! Categories: Big Boy Room!, Matthew, Sleep | Permalink. Bryson can be born now – I’m ready! I spent the day yesterday boiling a few new bottles (Med.ela Calm.a and Lan.sinoh Momm.a) and all of my breast pump parts. Man alive, I have a TON of breast pump parts! I pumped after every feeding with Matthew, and wanted clean parts each time so that I wasn’t washing parts all day. Now, I have quite the collection. It is handy having lots of clean parts ready for use, but it takes a lot of work to sterilize them all and then keep them organized. I’m not looking forward to the counter space they’ll take up! 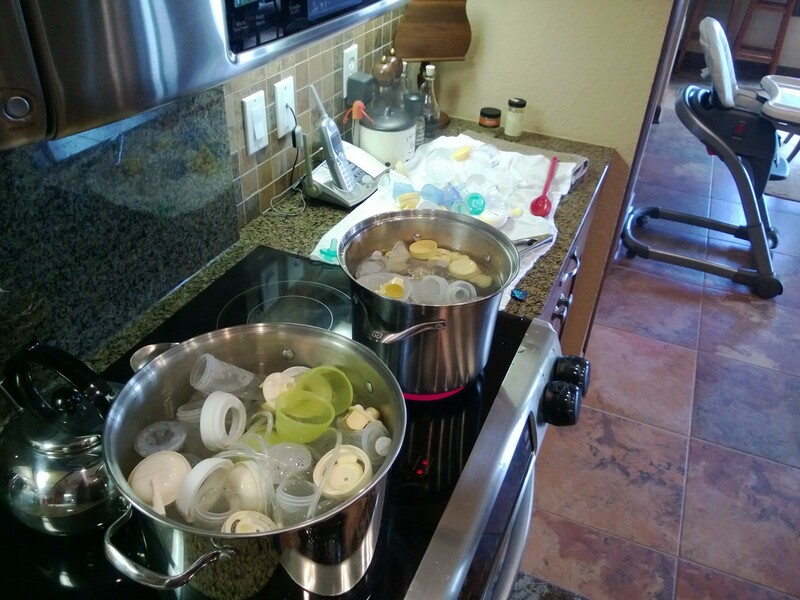 Two pots going at all times – it was a hot kitchen! I also did all of Bryson’s laundry! It was already washed and ready to go, but I wanted them all to smell fresh for him (since it’s been a year and 3 months of storage), so I got my two tubs of 0-3 months clothes out from the basement and washed them all in Dre.ft. Folding them wasn’t much fun, but it was fun going through all of them, remembering Matthew in them, and marveling that we’ll have a tiny baby again before we know it. Of course, my babies are not as tiny as one would expect – so the clothes actually look bigger than you’d expect for a newborn. I’m anxious to see what this little boy weighs in two weeks! I moved Matthew’s clothes out of the nursery and into his new room. WOW – that felt weird. We are finalizing things these final two weeks and Matthew doesn’t even miss his old room. He naps in there still (it’s nice and dark) and he enjoys that, but that is all. When we tell him to go to his room (not NEW room, just HIS room), he runs for the blue room with much excitement. This is great! He is sleeping just great each night (I haven’t had to go in at night in several days) and is falling asleep more quickly now. It still takes a good 30 minutes to get him to sleep, but that’s better than 60. After getting Matthew’s clothes out of the room, I was able to move Bryson’s clothes in last night. The room is pretty torn up with moving Matthew’s stuff out (lots of empty space on the walls), but it is 100% functional for Bryson, which is great. What a relief! I still want these two weeks with Matthew, but I feel better knowing that we TRULY are ready for Bryson if he decides to come early. Whew! Categories: Big Boy Room!, Bryson, My Free Time | Permalink. The Monday Snapshot – Big Boy Bed! Well… we did it! We didn’t even plan it – it just happened. My friend, Denise, came over with her daughter who Matthew thinks is his girlfriend. He LOVES showing off for her so immediately took her into his “new room” to show her his bed. He climbed up on the bed and they played and laughed with his stuffed animals. Upon seeing this, I turned to B and asked, “do you think we should let him try sleeping in here tonight?” He said we should give it a go so we did. It took me a full hour to get Matthew to settle down for bed last night. He kept sitting up when I’d try to escape and point to the bed and say, “sit down, sit down.” What can you say to that besides yes? I mean, really! He finally drifted off and I escaped at 10:15. He woke up at 1 “something” and I went in immediately. He has bed rails up, but he could get down if he tried or was pushing himself around in bed in his sleep (which he does do), so I was ready to go in instantly (I didn’t sleep well last night. SO NERVOUS!). I ran in, laid down next to Matthew and calmed him, and that was it. Or maybe it wasn’t, because I thought I was awake but came back to bed at 2:12 – so I may have been in there longer than I think. HA! Matthew then stirred again at 4 but was settled before I could get out of bed. He woke up at 6:15 (an hour earlier than normal) and we got him up for the day! 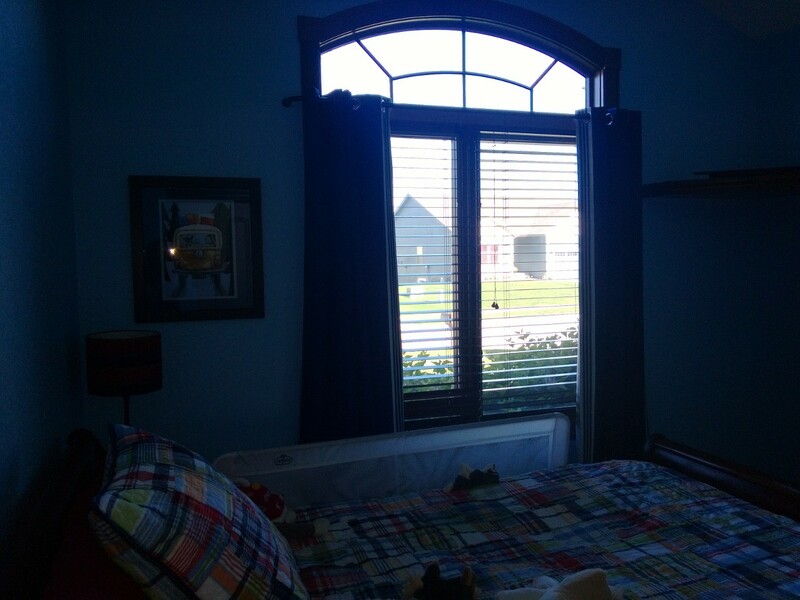 The new room is a lot brighter than his current room due to the arched window up above the main window. We did put blackout curtains over the blinds that were there, but that top window lets so much light in that if he stirs in the AM hours and notices the light, he’ll be up for the day (until he gets used to it, that is). This is a terrible picture, but here are the curtains and print hung up! Those curtains to block the light well! We started bed time a little later today because Matthew napped super late due to an “almost nap strike.” He only slept 8 hours total last night, so I insisted he nap and tried 3 times to put him down (he is still napping in his crib due to the light). I started singing to Matthew tonight at 9:20 and was out of there at 9:48 – a total of 28 minutes! Last night took an hour. We’re making progress! This is not at all how we planned to do this. We planned to start him out in his new crib for naps starting today and let him sleep in the crib at night for a few weeks, but he seemed so enamored with his new room (which isn’t even finished yet!) that we figured we should do it at night when it’s dark. So we totally changed our plan and it’s working. I know that this is working as it is because we’ve had the bed setup for weeks and we’ve been letting him play in his new room since then – so he really likes it. I just don’t think it would be going this well if we’d converted his crib to the toddler bed or full bed – because it would have been totally foreign to him. But who knows! And who knows what tonight will bring. I may be eating my words tomorrow! This is my contribution to the Monday Snapshot over at PAIL Bloggers. For more cute kids, click here! Categories: Big Boy Room!, FUN!, Matthew, Wordless Wednesday | Permalink. This room of Matthew’s has gotten out of control. I mean – 100% out of control. What started out as a simple plan is now quite elaborate and there’s more work to do each and every day. I’m supposed to be winding down, but I’m not. We’re not. We both have added things to the list of things to do. B wants the room to be “cool and fun” for Matthew. I agree. I think children’s rooms are supposed to be their safe places, their happy places. I want Matthew to like spending time in there, and that leads me down this path of infinite possibilities. And B too. For instance, I put the framed print from my sister up on the shelf in his room and asked B what he thought. He said that it’s not the right place and that he’d like to put pine trees up there. BRILLIANT IDEA! So now we need to get fake (or real) pine trees for that space. NOT IN THE PLAN. Another example. B bought me a polar.oid printer (for Mother’s Day) to create small prints from the photos on my phone, and then said that it would be nice for Matthew to have a pin or magnet board in his room to put them on. I loved that idea, so I spent tons of time on Etsy trying to find the perfect thing. I didn’t find it – which led me to PBK (which you all know that I have a love/hate relationship with PBK). I found what I thought was perfect, took B there last night to show him, he liked the idea, so I bought them. NOT IN THE PLAN. Upon coming home and putting them where I wanted them, B says, “that’s not what I had in mind, I want him to be able to reach it. I’ll find him a magnetic easel but keep these.” An easel is NOT IN THE PLAN. Then there are all the animals on the walls of Matthew’s old room that he loves – and B said that he thinks we should find different ones for his new room. Again, I LOVE the idea and have found lots of options, but they’re NOT IN THE PLAN. It’s not just B. I mentioned getting Matthew some Curious George sheets from PBK because he loves CG. We both know that this does NOT go with the outdoor theme, but we don’t really care. B thought it was a great idea so now we’re considering it. NOT IN THE PLAN. I got a bedside book shelf that we both think is perfect, but it was NOT IN THE PLAN. Oh – and along with those fun magnetic boards comes a need for fun, cool magnets. I’ve been busy on Etsy. Again, NOT IN THE PLAN. What I find so strange is that prior to being a stay at home mom, I was a project manager. I was a good one. I was excellent at managing scope and budgets, and kicking things out because they were NOT IN THE PLAN. But when it comes to my own projects, the sky is the limit and I sort of don’t care. It’s become a real problem. The same thing happened with our nursery – and that room doesn’t hold a candle to what this room is going to end up being. So yeah – the room is coming together but the project gets longer and longer because of our new ideas (my latest idea today was to buy a bona fide hiking sign from a campground sign vendor (yes, there really is one of those) – and B agreed). I’m out of control. And the worst part is – I have no interest in getting back into control. If you’ve been wondering where I’ve been, now you know! Categories: Big Boy Room!, Matthew, My Free Time | Permalink.